A tagline for Run, Ride & Soar is, “The joy of running in community.” After a five-inch rainfall on Thursday, September 10, there was no greater joy than celebrating a clear Friday evening with community, including both Bird-in-Hand neighbors and out-of-town visitors. Colorful hot air balloons launched, children excelled in the Kids Run, 5K runners crossed the finish line, and lots of pasta, pizza, pies and s’mores were served. On Saturday, September 12 the rain held off for the Half Marathon that began at 7:30 am. 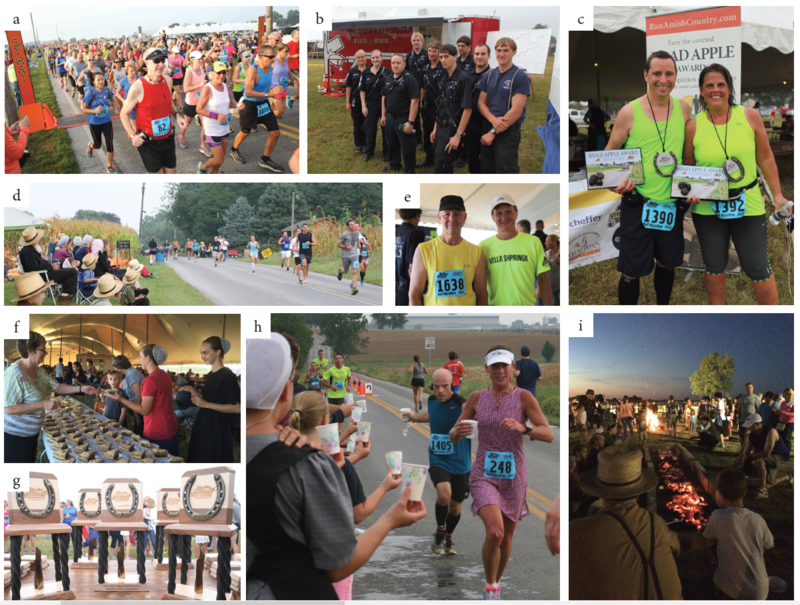 The country roads along the course were lined with enthusiastic fans and local volunteers who staffed the water stations. There were hoses for cooling off and musicians to provide inspiration. And as always, the scenery in the beautiful farmlands was exhilarating and made the challenging run worthwhile. This event is growing each year. There is a special community spirit here in Bird-in-Hand that draws people from 45 states plus Washington D.C., Puerto Rico, Belgium, Canada, Great Britain, Germany, Guyana, Ireland, Scotland and Sweden. We have a wonderful testimony of neighbors working side-by-side to benefit the local Fire Company. We have plenty of goodwill to go around. 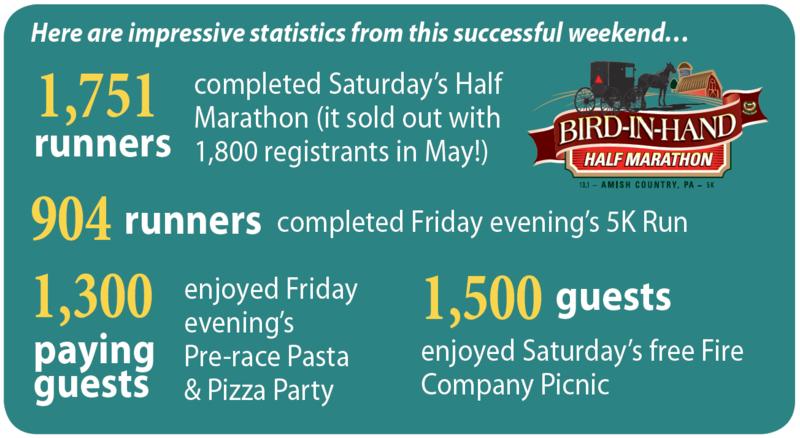 When the runners come to Bird-in-Hand, they really do experience the joy of running in commnity. Read their responses to the race. Great course, great weather, great folks! This experience is worth the flight from Germany!!! Fabulous race for a superb cause! I took a photo that captures everything: first responders, Amish pacer, runners and community! This was definitely one of the best, prettiest, and friendliest races I’ve ever done. Great job again BIH Half Marathon organizers. You sure do know how to do it right. Beautiful scenery, great volunteers, good food, friendliest and most organized race! Wonderfully organized, beautiful route and amazing people supporting the runners. During the after-race, I had a chance to sit with an Amish family. I thanked them for welcoming us into their community and serving us! Absolutely the most organized, family-friendly, scenic and downright “funnest” race I’ve ever run! My neck hurts from wearing my awesome medal around! a. Off and running, Half Marathon runners begin their 13.1 mile journey. b. Gordonville Ambulance personnel are ready to provide vital runner rehab services. c. A happy couple displays their horseshoe medals and Road Apple Awards. d. Community members gather along Church Rd. to cheer on runners who love our countryside. e. Race founders John and Jim Smucker lend their support each year. f. Lou Ann Hoerner serves shoofly and apple pie, traditional goodies that represent the hospitality of our area. g. Local craftsmen spend significant time hand making all of the awards given at our races. h. Local families provide a much-needed service of handing cups to runners at 10 different aid stations. i. The end of a perfect evening is making s’mores over an open fire as locals and out-of-town guests mingle.